It's only a matter of time before the "A" on that sweater becomes a "C." Patrice Bergeron will be the next captain of the Boston Bruins. Now, this obviously doesn't come as a shock to anyone, but hearing head coach Claude Julien confirm it, makes it all the more real. 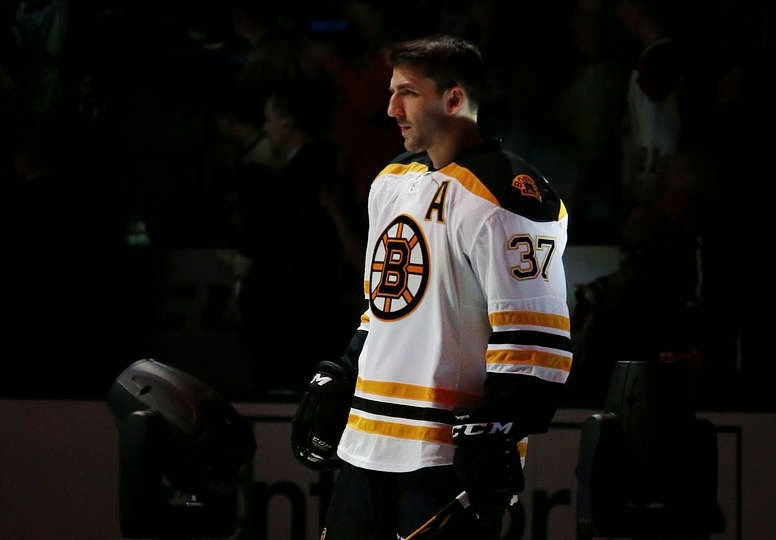 "It's probably undeniable that down the road when (Chara) is done with his career, if Bergeron is here it would be pretty hard to not make him the next captain," Julien said, according to CSNNE.com. It seems hard to believe that he is only 29-years-old, it feels like he's been here forever. Bergeron, who entered the NHL at age 18 in 2003, drafted in the second round, has spent all of those years here in Boston and knows what it takes to be a winner. As a veteran, Bergeron has already had a career full of experiences where he has had the opportunity to see how leaders act. He's won a Stanley Cup and he's also won gold medals, both at the Junior and Olympic levels. Bergeron has had many great mentors throughout his days in Boston, and the current captain Zdeno Chara is no exception. They've worked quite well together and ultimately, it feels like this team already has two captains. A lot of fans feel that Bergeron is underrated, and there is some truth to that. Although, more and more people are starting to see his value as he progresses in his career. Bergeron is arguably the best defensive forward in the league and has the ability to play a great two-way game. He's also quite capable of putting the team on his back, whereas Chara seems to have lost that characteristic as of late. It's easy to lead when everything is going well and the team is winning, but it's another thing entirely to lead when things are going wrong. Throughout this up and down season, Bergeron has been the one constant; always bringing effort night in and night out. He is currently leading the team with 44 points and is tied for the team lead in goals with 18. Zdeno Chara still has some time left here in Boston, so this won't be an overnight change. With that said, Bruins fans can rest assured that when the time comes for a new captain, Bergeron will be more than ready to take the helm.